Maxwell Equations: Overview. Magnetostatics: Scalar Potential Approach. Solving for the Scalar Magnetic Potential. The Approximate Magnetic Potential: Properties and Shortcomings. New Tools: Whitney Elements, Symmetry. Complementary in Magnetostatistics. Magnetostatistics in Infinite Domains. Eddy-Current Problems. Mathematical Background. Appendices. Subject Index. 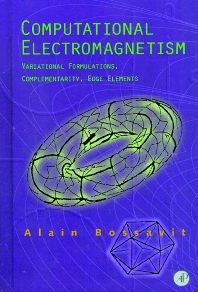 Computational Electromagnetism refers to the modern concept of computer-aided analysis, and design, of virtually all electric devices such as motors, machines, transformers, etc., as well as of the equipment inthe currently booming field of telecommunications, such as antennas, radars, etc. The present book is uniquely written to enable the reader-- be it a student, a scientist, or a practitioner-- to successfully perform important simulation techniques and to design efficient computer software for electromagnetic device analysis. Numerous illustrations, solved exercises, original ideas, and an extensive and up-to-date bibliography make it a valuable reference for both experts and beginners in the field. A researcher and practitioner will find in it information rarely available in other sources, such as on symmetry, bilateral error bounds by complimentarity, edge and face elements, treatment of infinite domains, etc. At the same time, the book is a useful teaching tool for courses in computational techniques in certain fields of physics and electrical engineering. As a self-contained text, it presents an extensive coverage of the most important concepts from Maxwells equations to computer-solvable algebraic systems-- for both static, quasi-static, and harmonic high-frequency problems. Benefits To the Engineer A sound background necessary not only to understand the principles behind variational methods and finite elements, but also to design pertinent and well-structured software. To the Specialist in Numerical Modeling The book offers new perspectives of practical importance on classical issues: the underlying symmetry of Maxwell equations, their interaction with other fields of physics in real-life modeling, the benefits of edge and face elements, approaches to error analysis, and "complementarity." To the Teacher An expository strategy that will allow you to guide the student along a safe and easy route through otherwise difficult concepts: weak formulations and their relation to fundamental conservation principles of physics, functional spaces, Hilbert spaces, approximation principles, finite elements, and algorithms for solving linear systems. At a higher level, the book provides a concise and self-contained introduction to edge elements and their application to mathematical modeling of the basic electromagnetic phenomena, and static problems, such as eddy-current problems and microwaves in cavities. To the Student Solved exercises, with "hint" and "full solution" sections, will both test and enhance the understanding of the material. Numerous illustrations will help in grasping difficult mathematical concepts. Graduate students and researchers involved in computer simulation of electromagnetic phenomena; applied mathematicians, especially those interested in applied PDEs and the finite element community; practitioners in the industryworking on numerical computations of electromagnetic fields and design of electromagnetic devices.